I can think of few writers and creators of our current age who have reflected the twisted, fearful nature of the modern mind better than Stephen King. For decades now he has consistently (though not always) made me shiver with terror with his tales. He's created an impressive mythology of American horror. Some tales work better than others, but when he is on the mark, he's one of the best ever at his trade. Last year filmmaker Frank Darabont tackled a King novella called "The Mist", which is out now on DVD. The initial release of the movie made little impact at the box office, but I'd expect more folks will watch the DVD and I think the movie is another example of how his tales can unnerve us, make us afraid not only of unnameable monsters but afraid of other people. And while I did like the movie, I liked the experience of reading the novella more. Books are almost always better. But this movie works for several reasons. Solid performances from the actors in "The Mist" are part of the success, and unlike the somewhat lyrical tone of Darabont's other King adaptations ("The Green Mile" and "The Shawshank Redemption"), his camera captures a sense of ordinary light and ordinary places in this film. Early on, we know this will not end well. The situation is quickly and simply presented - an immense cloud of fog and mist settles into a seaside town just as chaotic scenes occur. Sirens wail and troops from a nearby military post roll in by the truckload. A large group of townspeople inside a grocery store watch the chaos and a wounded man enters warning them of horrible dangers and death coming out of the mist. Trapped by their own fears, it does not take long for paranoia to take hold of each of them. What is unknown is frightening, but it's the meltdown of social order which truly disturbs the townspeople and the viewer. King has often given this scenario before - remove the trappings of ordinary life and many people become capable of monstrous acts quite quickly. Some viewers have complained about the religious fanaticism which one character uses to dominate the others. Too often today the fruits of such fervor are far to common in our world, and not a wild indictment of the faithful. I liked the movie, even with a different and harsher ending than the original story. Although, as with most of King's stories, I try and comfort myself that I would never, ever act the way those people did. It's a small indulgence I think most of us hold to when we encounter the really scary things in life and in the imagination. 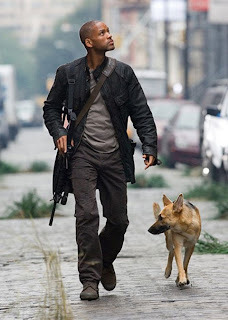 Another apocalyptic tale arrived on DVD last week, "I Am Legend" starring Will Smith, a movie based more on the 1971 Charlton Heston movie than the original 1954 novel by Richard Matheson. Smith plays Dr. Robert Neville, lone survivor of a worldwide virus which has devastated the planet. The worse news is that others did survive but as mutated creatures who ... well, they look nasty and all, but there isn't much mention of their habit of vampirism from the novel's plotline. The creatures are unable to move in a daylight world, and are attracted by blood, but that's the only element in this version of the story. Before I say anything else, I have to praise Smith's performance in the movie. He is nearly mad from loneliness and despair, which is brought out in several terrific scenes as he talks with mannequins he has placed around the city of New York and when he recites lines from the movie "Shrek" in another key scene. The narrative also goes back and forth between the times of the plague and the present of Neville alone, which does allow for a look at how Neville devolved (or evolved) into a Legend among monsters. However, this movie is not the book. I liked the movie, mostly due to the way Smith plays his character and the ending originally made for the movie is far better than the one that got released to theaters (you can watch it here, but it will make no sense unless you've seen the film). It's too bad the filmmakers followed the Heston version more than the novel. Oddly, one archivist I found claims that Heston was given the book to read by Orson Welles when the pair were making their film noir classic "Touch of Evil" and that Heston tried to cut a deal with the studio for Sam Peckinpah to direct. I would love to have seen that movie, as Peckinpah would have understood the story Matheson wrote - that a non-mutant human was the real Legend in a world populated by mutants, that he was alone and a relic of the past and not the present or the future. 40 years ago this week, the landmark movie "2001: A Space Odyssey" was released and an excellent collection of writings and memorabilia can be found here. Sadly, it arrives just days after the passing of writer Arthur C. Clarke. Both Clarke and director Stanley Kubrick achieved a unique moment with their movie. It is a monument to possibility and imagination, a spectacle which still inspires with awe and wonder, expands the ideas of cinema and fiction as no other movie has ever done. It is truly Frank Miller's time - following on the first-rate adaptations of "300" and "Sin City", Hollywood is awaiting "The Spirit", which Miller is also directing, based on Will Eisner's classic crimefighter. A website for the film is now online, with more features coming soon. Also, the movie which stars Samuel L. Jackson, Eva Mendes and Scarlett Johansson had some production photos leaked onto the web and you can still see them (for now) right here. Also his graphic novel "Ronin" is getting lots of buzz and the director of "300", Zack Snyder is hard at work on an adaptation of of Alan Moore's cult classic "The Watchmen". 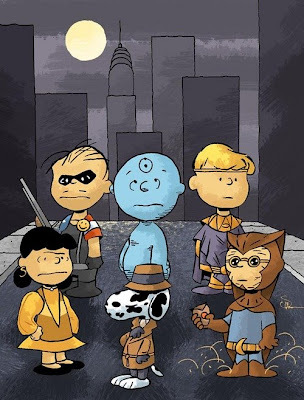 Also this week, BoingBoing offered a vision of the cast of the story as enacted by the characters from "Peanuts" ... gotta love that! I did not know that public libraries were hotbeds of violence - but apparently they are in Knox County. How else to explain a new program to screen visitors/patrons at random with a metal detector? I saw the report last night on WBIR, and I just can't see a reason for it. Are there some threats and dangers which the county knows but is fearful to speak of? "People are getting used to (screenings) everywhere they go. You know, you can't get through the City County Building without going through one, any of the courthouses, of course, the airport, so they're really becoming a way of life in this day and age. It's unfortunate, but it's necessary," Claiborne said." Well that worldview is sad, very sad. A way of life, she says. Given that violent acts have occurred in the locations she mentions, we should simply accept strict security measures at every location? I'm afraid the answer in America today is yes. We are afraid of each other as never before. I noticed in their video report a few things - first, the security officer is not armed with a gun - what if a patron does try to enter carrying a couple of Glocks and and some pipe-bombs? Second, towards the end of the video, a patron empties their pockets and you can see him remove a hefty pocket knife and deposit it in the tray at the security station, a knife he then picks up to return to his pocket after being 'wanded'. Um. Isn't that a weapon? Keep in mind that state officials have been pushing for the right of folks to carry a concealed gun into a bar. We need security checks at libraries?? Officials say this is just a test program. Of course, keeping employees and patrons safe from violent attack is a good intention. Other public libraries have similar programs, and there is of course a new 'industry model' where public libraries contract out for security measures. It's a fast-growing business. Is the norm for the 21st century American life to be the increased reliance on private security firms and agents? As previously said, many of us seem to believe it is "unfortunate but necessary". Starting next month, a printer which can rip out 16.5 high-resolution pages per second(!!!) is headed to consumers. Time was when hit with some insomnia on a night in early Spring, I might have taken to the road and found some forgotten diner and sipped coffee, had some pie, maybe play the jukebox and strike an Edward Hopper moment of timelessness. Or, more recently, there was television's endless surfing, no longer a domain where anything even close to a 'sign-off' ever appeared. Instead tonight there is the unbounded internet, where time has no meaning, and someone has already created a page to document each soul and each soul's imagination. I can see what people are doing these days with bacon. Or I can read a brand-spanking new sci-fi story at Futurismic, called Mallory by Leonard Richardson (warning: profanity abounds) in a satiric jab at our connected un-connectedness. Then there's the video presentation about the search and wonder behind the question "What did Leonardo Da Vinci really look like?" If you seek a museum of the water-gun, or the tools of another age, or maybe old radio shows, or anything it's out there. Did you know if you just type in "what is everyone doing right now?" on Google you'll have 24 million options to choose from? There is much to capture your attention and - wait a second ... I think my cat wants to play with some string. I'll just do that then and you keep drifting thru the web. We'll get together later. While supporters were hoping for a response in the tens of thousands, the numbers were more in the hundreds for independent truckers attempting a nationwide strike this week. (See previous posts here and here, and a mention of this humble blog in today's Knoxville News Sentinel.) MSNBC reported a three-mile convoy of slow trucks outside Atlanta yesterday, but the protests were limited nationwide. English posts that contain Truckers Strike per day for the last 30 days. Being independent means often operating under contracts written before the high prices now at the pump, while drivers working with large corporate organizations have a simple remedy for such problems - they don't pay for the fuel costs, the company does, and when prices go up, the consumer of the products being transported are the ones who pay higher costs. Let's say the independents can get far more participation from their own ranks. It won't bring fuel costs down. Will it spur some type of action or reaction in government or business? Or will it just put the average consumer at another disadvantage and hollow out incomes even more than they already are? NOTE: For the most recent info, see this post - thanks! I've spoken with a few friends in the trucking industry, and though they don't want to be identified, they have all said the proposed strike to protest high fuel prices hasn't got much participation in East Tennessee yet. Still, it's worth noting that the calls for a nationwide strike by independent truckers have been constant since mid-March, such as the efforts found on a site called Trucker-To-Trucker.com. Quite a few drivers are off the job now, and they have been talking about and debating the strike for weeks. Their effort is called Enough is Enough, and you can check out the debate here, with many comments over the last few weeks. Independents still have major hurdles - coordinating a time for a strike, loss of income, getting the attention of the media, and the fact that the number of independent truck drivers are just a small percentage of the overall industry, about 10 percent according to estimates found here, and the writer sees the proposed strike may do more to reduce those numbers. Some drivers may be off the road for days, some may just drive slowly to hinder traffic and gain attention, and another effort may be launched for May 1st. I'll have some more info on this soon. More rumors swirl about the strike - but just as quickly as they rise, others bat them down as mere talk and speculation with little to no results. I spoke this afternoon with Sharon Donald with Pilot Oil , who said of their Travel Centers "Everything is business as usual today. Absolutely nothing is happening," regarding a strike by independent truckers." She added the only talk about the strike she has been aware of is the talk from media sources like the cable news networks. WBIR reports that the American Trucking Association says: Through a statement from the American Trucking Association, Tennessee's Trucking Association said they don't support the walk-off. "We would not participate in or condone any strike," ATA Public Affairs VP Clayton Boyce said. "It is hurting the wrong people and would not accomplish what they want to accomplish." The comments on that report range from the frustrated and angry to statements of support. Also, some other sources I spoke with indicated to me they were being told to downplay any news and simply state there were more rumors than facts about the strike. The Charleston newspaper The Post and Courier echoes the denial that a strike is taking place. Still reports trickle in citing stoppages and delays from Chicago to Tampa though the number of those participating is very small. "We are repeatedly asked by the media if a strike will have an impact and so we remind them that it’s not just about one day, or one week; it’s about the longer term if diesel prices do not change. Truckers are consumers, too,” said Norita Taylor, OOIDA media spokesperson. OOIDA leaders say that while the Association cannot legally support a strike, it can and does support individual truckers. The Association also encourages individual truckers to contact their lawmakers now about the fuel situation. “We do not tell our members what to do; instead, they inform us of what they ARE doing and we support their decisions,” said Todd Spencer, OOIDA executive vice president. Spencer said that truckers need to make it known to their elected officials that they are being exploited in the current fuel situation and that action needs to be taken to change the industry. SEE ALSO: This message board on Topix has logged over 137 pages of comments about the calls for a nationwide strike since last week. A Strike By Truckers Ahead? I've seen it mentioned in the news, and likely you have too - rumblings and reports that independent truckers plan to stop driving today and are making convoys to protest the high price of fuel. Michael Silence is blogging about what's happening in Knoxville. "There's nothing ever like this," said owner Derrell Clem, whose firm operates 23 trucks. "Fuel prices are unfair to the trucking industry. Clem said he planned to close his business for two or three days starting today because of diesel prices that have soared 40 percent in the past year to a national average of $4.02 a gallon. Diesel prices in the Nashville area were $3.91 a gallon on average Monday, up from $2.76 a year ago, according to the latest AAA fuel price survey. Clem said he pays $230,000 to $240,000 a month in fuel to keep his small fleet of trucks rolling, delivering merchandise to supermarkets, auto supply companies and other clients. "I think if something doesn't happen they are going to put the small companies completely out of business," Clem said. It was hard to gauge the extent of truckers' protests on Monday or predict whether there would be any economic ripple effects if products weren't delivered to stores, warehouses or factories on time. In some states, independent haulers said they would park trucks for two or three hours or drive more slowly on the highway even if it meant disrupting traffic. The Tennessee Highway Patrol said it plans to monitor the situation on highways here." In Georgia, reports say plans are being made for a full nationwide strike on April 3rd. Congress has questions for the nation's oil industry (again). After seeing so many emails in the past urging drivers to boycott one gasoline company or another for one day, this may be a good opportunity to make a more potent statement. Would you join these truckers for a one-day boycott of all driving and all gasoline purchases? Call me digitally dumb or digitally delusional. It's just that keeping up with the constant flow of technological change usually results in me standing alone with a stupefied look on my face. I ponder on it, trying to maintain a useful footing in the digital world, but such footing always seems to be tentative. I was reading about the federally mandated change to television broadcasting, which will bring about the end of analog television next February. The FCC has sold off the broadcast spectrum for analog now, for nearly 20 billion dollars. Some fear that the once-freely available signals have been gobbled up by telecom giants. Some folks are supposed to get vouchers to buy digital converters for their TV sets through a federal subsidy. It just seems odd to me that the government is mandating a change which was already taking place and forced it to all change at a particular moment. Was that really necessary to push it along? Only time can answer who will benefit the most and the best from the changes. In my world, I confess to having cobbled together a variety of ill-fitting components to access the digital world. Old computers lay around like old transistor radios here. I'm on a mega-fast broadband internet access yet I use this keyboard designed for typewriters back in the 1800s. In the basement, hundreds of big, black, flat discs called LPs sit wondering where the heck the turntable went to. There is a cassette player in my truck which does not work anymore, and I have a portable CD player instead, which is an ungainly monster compared to the sleek and tiny iPods and MP3 players many others have instead. In order to be current, it seems I should have one of those wee audio devices which can hold thousands of songs, and a plasma Hi-Def television with 5.1 digital sound, and a phone which can take still and moving images, store music, connect to the internet and text-messaging machine and I don't even know what else I am not doing. Should I be live-blogging my life via a Blackberry instead of sitting in front of a computer? Do I want to actually take the time to reconfigure the old turntable and download LPs to a digital format to store in a wee audio device? Do I really want to transfer the music I own on CDs for wee audio device storage? I've tried discerning if the sound quality of an MP3 file or a wav or a wmv, ogg, MP3Pro, AAC, AAIF, MPEG4 with that of what used to be called CD-quality and what was once available on on the old analog LP. My untrained ears do notice a loss of quality on the iPod and iPod-like wee audio devices, but who am I to question the Advance of Civilization? Still, there are so many excellent new ways to live and communicate and even manufacture goods for the world to consume. A recent Wired article talks about the ability to create, manufacture and sell products in minutes, with companies like Ponoko, and on-demand manufacturing service. No factory need be built or contracted, just ship them a design for furniture or clothing and they create it only when they get an order for a product. But I cringe at using words like "instaprenuer". And to dare mention my eccentric concerns makes me something of a fossil as I straddle the analog and the digital worlds. Some less tech-savvy folks might think me a wizard, other far more tech-savvy and affluent folks think me a caveman. After all, I still read books. I barely can write useful code. The future may have no need for me whatsoever. The future is making itself. Does Earth Hour Mean Anything to You? Yesterday millions of humans all over the planet joined an 'initiative to raise awareness' called Earth Hour and turned off lights and other electrical equipment for 60 minutes. Mention was often made in most news reports of the lights being turned off at the Sydney Opera House. I know it's notable as the location is a widely known landmark. I'm not sure that an unlit Opera House qualifies as a sacrifice. I understand the goal was to 'raise awareness' or 'educate' folks about the issues of energy usage. Still, I wonder what the typical response would be if, say, that TVA decided they would 'raise awareness' by eliminating all electrical power to every customer they serve for one hour. Howls of calamity and forced suffering would likely follow. 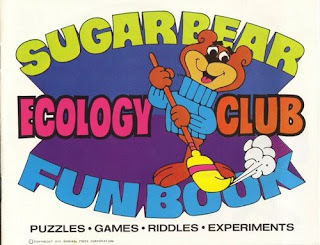 But such an effort would seem to be far more educational than voluntary electrical reduction. 1.6 billion humans live without any electricity every day - here's a link to a satellite image of the planet at night. Granted, fewer people live without electricity today than ever before. And perhaps it is worthwhile to break through those protective cocoons of affluence for sixty minutes and hope that folks begin to consider life beyond/without gadgets and luxuries. Perhaps. Back then I decided I would build an energy-independent house, an underground home lit by a central atrium and by solar panels so I would not have to pay for or waste energy. Yeah, I should definitely do that. And I want my personal anti-gravity vehicle too. Like so many others who share this wee spinning planet, I have good intentions.